Qustodio is a web-based parental control software that allows parents to be with their child everywhere they go. Allowing your child to have a cell phone is a scary thing. Not only are you giving them the ability to be in contact with whomever they want, you are also giving them access to the internet. The internet is a playground that many children get lost in. You never want your child to be persuaded to do bad things, but limitations need to be set when it comes to internet usage on a cell phone. Qustodio gives you that ability, and so much more. Life takes us in all kinds of directions. It is impossible to know what your children are doing all the time. However, it is our jobs as parents to ensure their safety, and teach them what’s right from wrong. There are millions of parenting tools that you can invest in, but they do not always suit our needs or budget. Qustodio is an advanced parental control app that allows you to guard, oversee, and become aware of your child’s internet activity, as well as who they are contacting. Installation is easy, and you will be able to control all aspects of Qustodio from your account dashboard. Navigation through the dashboard is user friendly, and you will be able to understand what your child is doing while on their electric devices. From the data that is collected by Qustodio, you can define boundaries, which will allow your child freedom in a safe and secure way. What Devices Can I Monitor With Qustodio? Qustodio works with almost all cell phones, computers, and tablets. You can install the application on Windows, Android, Apple, Kindle and Nook devices. It also works on computers and laptops with Windows, Mac, IOS or Android platforms. What Type Of Packages Are Avaliable? There are a number of package options, which are designed for families, schools, and businesses. Choosing a package will depend on the number of users and devices you need to monitor. Free Account – With a free account you can monitor one user and device. Premium 5 – Monitor 5 users and devices, and gain access to premium features. The Premium 5 package cost $49.95 per year. Premium 10 – Monitor 10 users and devices, and gain access to premium features. The Premium 10 package cost $87.95 per year. There are larger plan options available if you need to monitor more. Call & SMS Monitoring and Blocking. The better question is… What can’t you monitor? 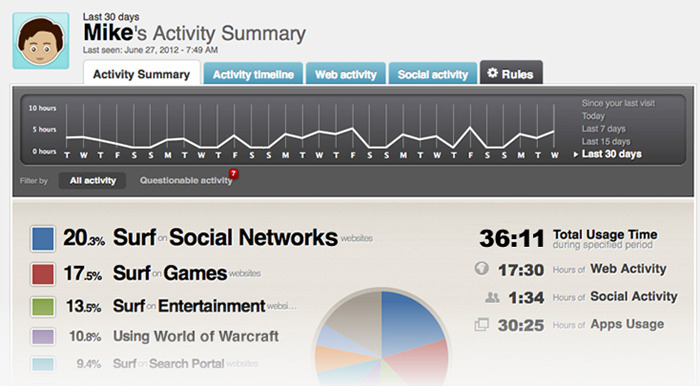 With Qustodio you can monitor social media, such as Facebook, Twitter, Instagram and Whatsapp. There are filters, which allow you to restrict content from being accessed or even popping up in a search. Restrictions can be set to define how long your child has access to the internet, apps or games each day. You can block websites, social media, games or apps that you do not approve of. Monitor all incoming and outgoing calls and text. See their contacts, as well as those that have been deleted. Block contacts and be alerted if your child tries to communicate with them. The GPS feature will allow you to see your child’s location, and there is a built in Panic Button that will send out a call for help. 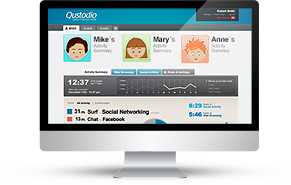 Qustodio is a cloud based application, and you have the ability to monitor more than one kid at a time. You can access your user dashboard from any internet ready device. Plus, your kids will not know they are being monitored.